Patient 1 - This is a lovely 66 year-old woman who demonstrates the benefits of facial fat grafting combined with an extended SMAS facelift. She does not have much extra skin or fat but mainly needs volume placed back into the face, especially around the eyes to take away the hollowness from previous browlift/blepharoplasty. 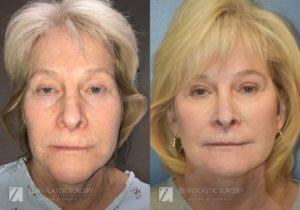 Facelift plus fat grafting also allowed her to regain a youthful full cheek and a supple age-defying jawline. Fat grafting of the lips also help add youthful fullness and improved the vertical wrinkles of the upper lip skin. This is her 2-month follow up result. Patient 2 - This 66 year-old nicely demonstrates the benefits of rejuvenating the eyes with the rest of the face. 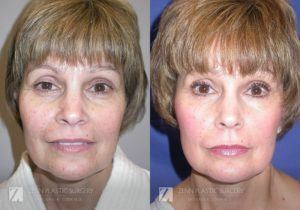 She had the signs of aging around her eyes with bags and excess skin and had laxity of the face with extra skin around the neck with noticeable bands. 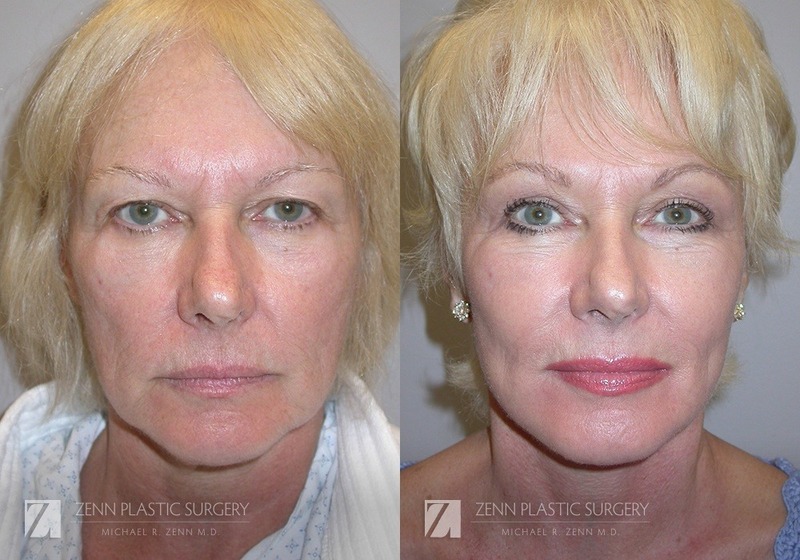 Dr. Zenn performed an extended SMAS facelift with plication and 4 months later an endoscopic browlift, upper blepharoplasty, and lower blepharoplasty. 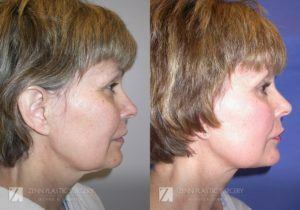 Note on her 7- month follow up that she is greatly improved but natural appearing and not overdone and obvious. 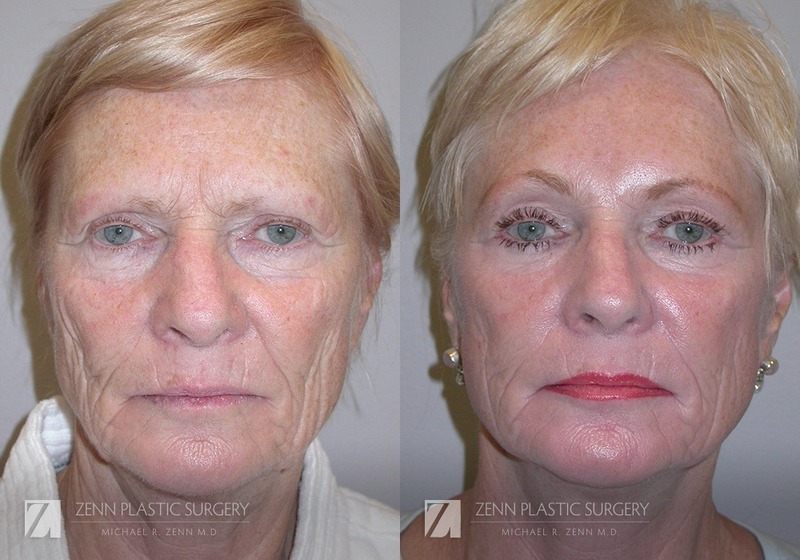 Patient 3 - This 67 year-old had standard facelift and blepharoplasties in her 50’s and presented with recurrent aging changes that were addressed with redo of the facelift and eyelid surgery and thins time re-volumization of the face with fat grafting. 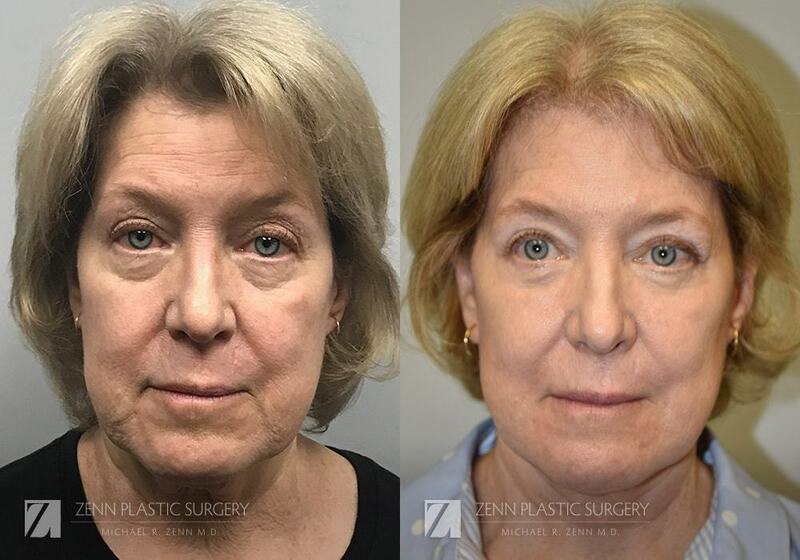 This is her 4-month follow up after upper blepharoplasty with skin, fat, and corrugator muscle removal, a transconjunctival lower blepharoplasty to remove fat bags, a facelift, and 25cc of fat grafts to her cheeks, and jawline. Note how much softer and youthful the overall appearance is, especially the full cheeks and the smooth jawline. Patient 4 - This is a 63-year old, who 13 years earlier had brow lift and upper blepharoplasty, presented with aging changes to the midface, lower face, and neck. Dr. Zenn performed a lower blepharoplasty with lower lid suspension to remove eyelid bags and brighten her eyes, SMAS facelift to elevate the cheeks and sculpt the neck, and facial fat grafting (18cc) to enhance the overall result of the face. 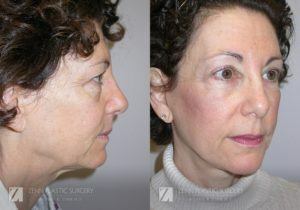 Fat grafting, artistically done, softens and creates more youthful cheeks and jawline. This is her 2 ½ month follow-up. 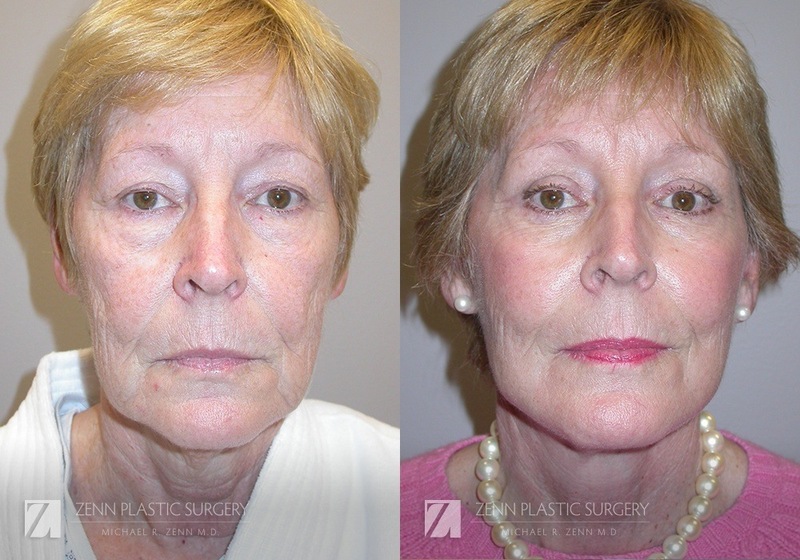 Patient 5 - This 63-year-old desired a more youthful appearance. 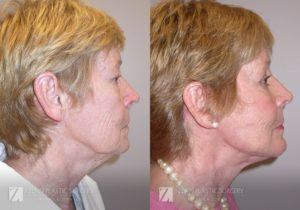 Her prominent jowls and loss of neck definition made her look old. 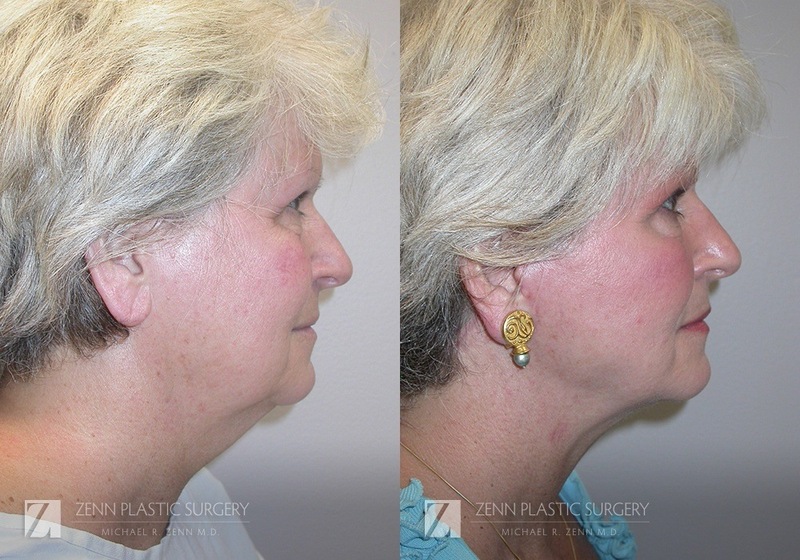 Dr. Zenn performed a subcutaneous facelift with platysma plication, giving her the more youthful neck she desired. 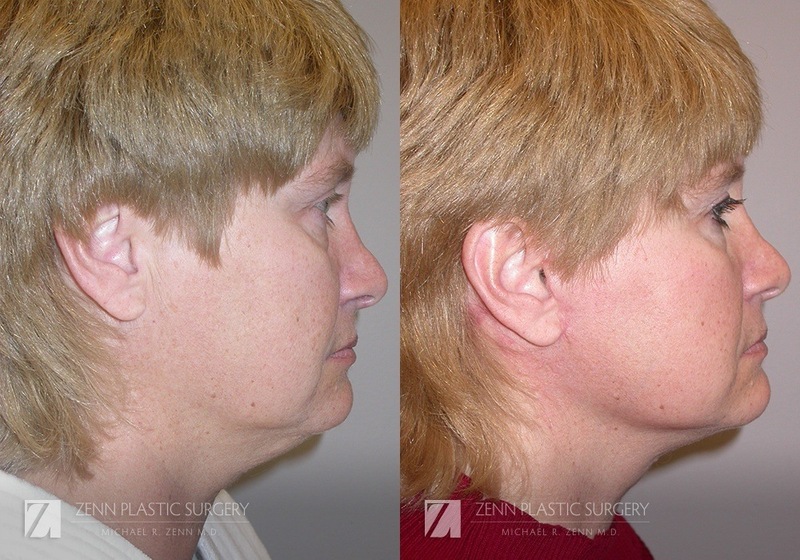 Shown is her result at 3 months post-surgery. 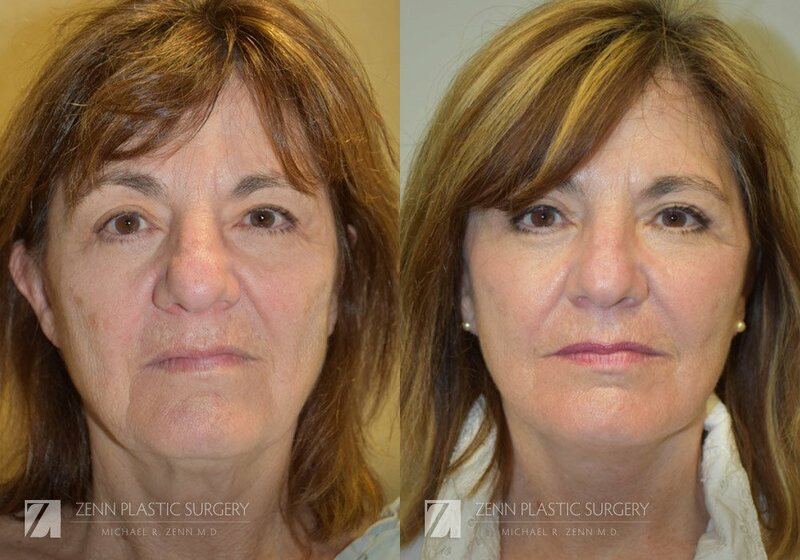 Patient 6 - This 51-year-old woman was happy with her facial appearance but hated seeing herself in photos from the side which made her look older. 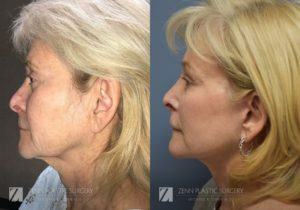 Dr. Zenn performed a facelift with extended SMAS, giving her back age-appropriate definition to the neck and jawline. Shown 3 months post-surgery. Patient 7 - This 65-year-old felt she looked much older that her peers. 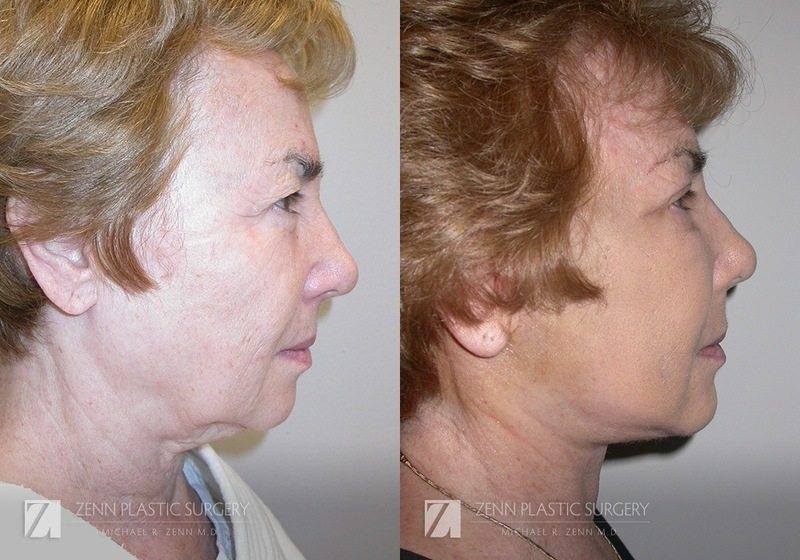 Her skin was sun-damaged and she had extra skin that obscured her neck and jawline. 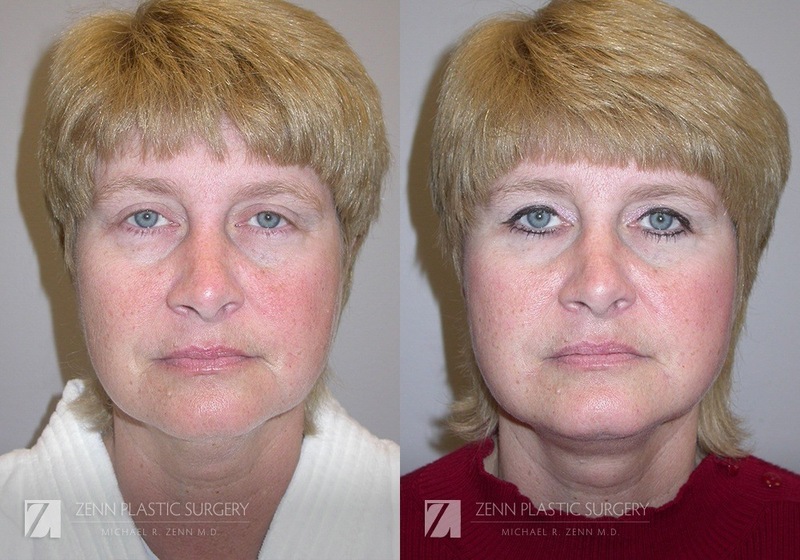 Dr. Zenn performed a subcutaneous mini-facelift with lateral platysmal plication and facial fat grafting. Her eyes were made much more youthful with an endoscopic brow lift and lower blepharoplasty. 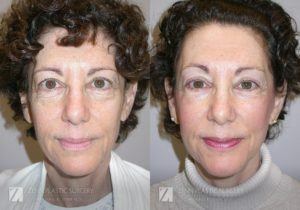 The results at 6 months show age defying definition without the “windswept” look of being overdone and obvious. Patient 8 - This 65-year-old woman looked much older that her age due to the squareness of her lower face which resulted from drooping facial tissues and her marked skin wrinkles. Dr. Zenn gave her back a more youthful appearance with a facelift and upper and lower blepharoplasty. At 3 months, she has a more sculpted neck and jawline and freshening of the eye area. 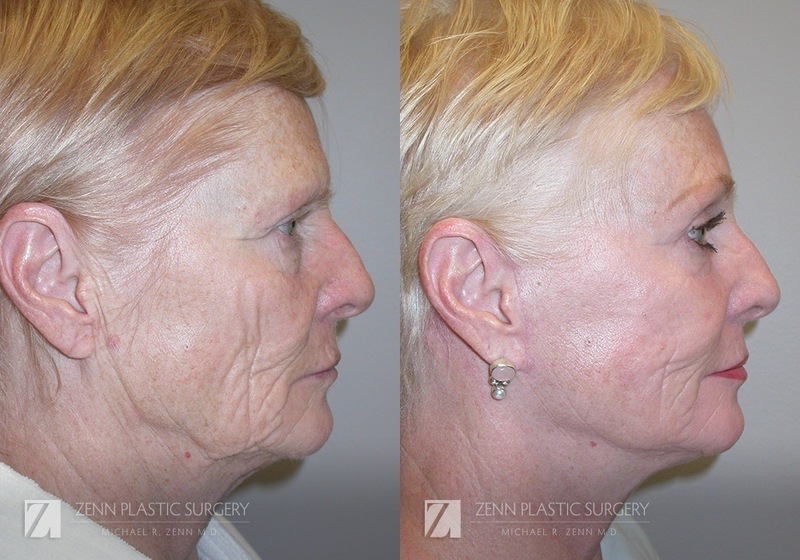 Patient 9 - This 69-year-old woman had typical features of age with descent of facial tissues giving her lower face a rectangular look, from jowls and loss of jawline and neck definition. 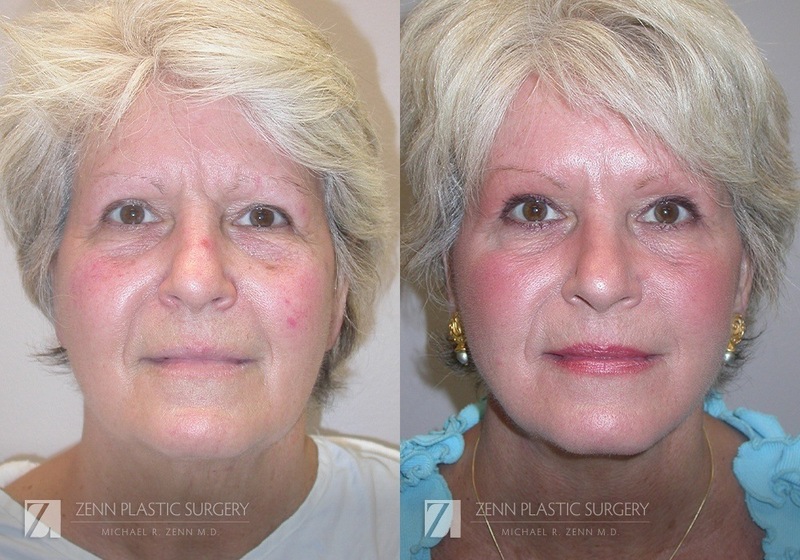 Dr. Zenn performed an extended SMAS with plastysmaplasty and an upper blepharoplasty. This is her result 1 month after surgery. 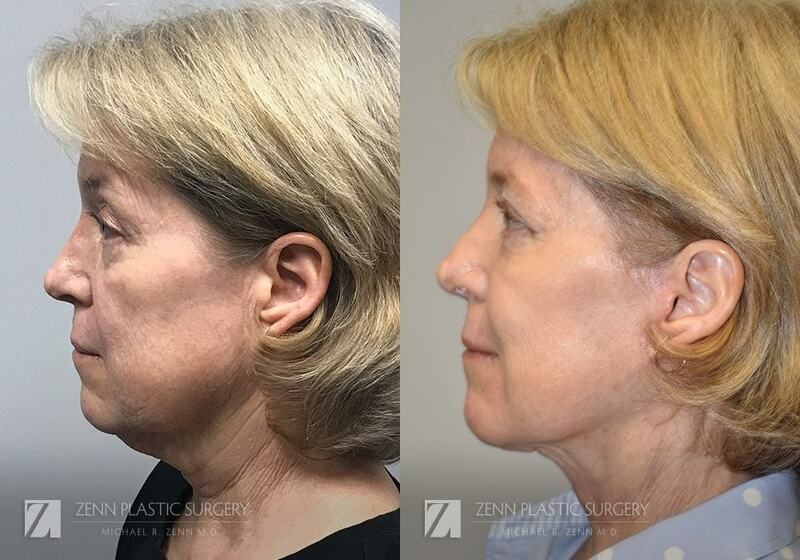 Patient 10 - This 59-year-old presented with great bony structure and cheek fullness that gave her a naturally youthful appearance, except for the small amount of skin that collected under her chin. 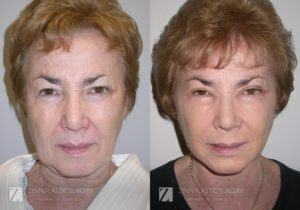 She had an extended SMAS facelift with platysma plication to remove that skin and early jowls and also a lower blepharoplasty. These are her 5 month results. 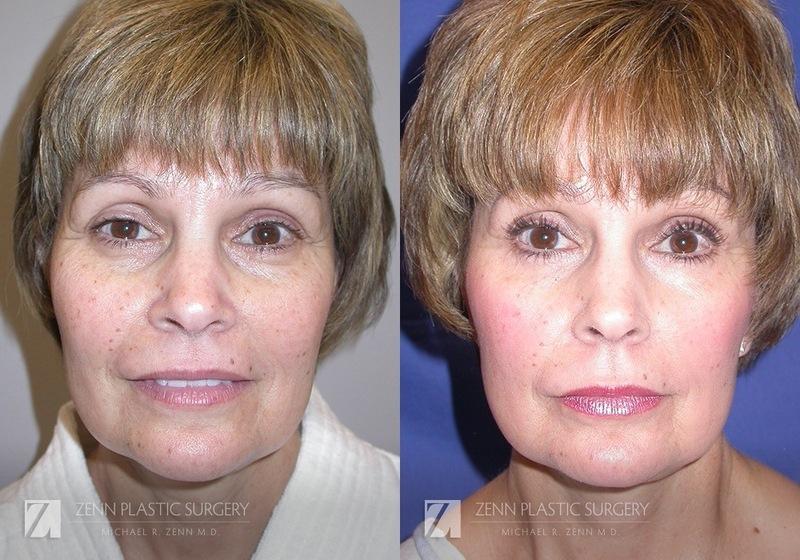 Patient 11 - This 56-year-old had her eyes done 5 months earlier and was bothered by the small amount of extra skin under her chin. 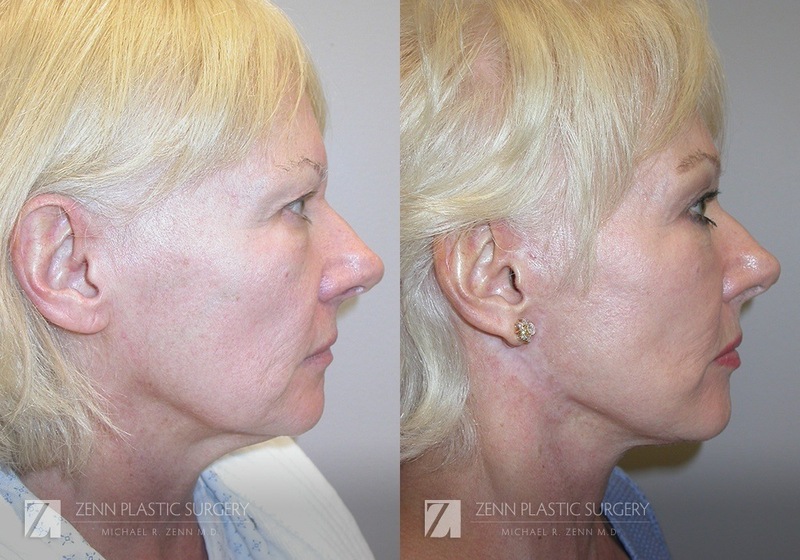 Dr. Zenn performed a SMAS facelift with lateral platysma plication. This is her 3-month result.